Creatures great and small spring into action on a sunny day. With a determined cadence and a graphic bang, Lawson and Bisaillon wed their talents in presenting a sumptuous snapshot of nature on the go. 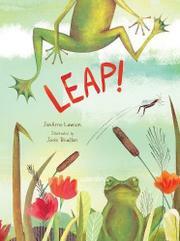 Lawson’s animated poem starts small with an irritated flea’s decision to “LEAP!” that then leads to other creatures making similar jumps in a great crescendo of movement that climaxes when a horse leaps a fence before things return full circle to the flea at rest. Motivated by the irresistible impulse to move, the flea hops “into the path / of a little grasshopper,” who then lands on a bunny, who “bounds out / as the clouds roll in,” inspiring a dog to jump into a lake and scare the fish “wide awake,” as they “break the surface with a / flip, flop, shake” and “knock off a bullfrog’s / lily-pad crown” as he springs and lands right “next to the nose / of a high-strung horse,” who rears back from taking a drink of lake water, and…one gets the idea. Bisaillon’s vibrant, watercolor-inspired mixed-media illustrations capture the fullness of the domino effect of Lawson’s action-packed lyric, vibrantly showcasing the interconnectedness of flora, fauna, sun, and sky.